This screenshot has 3 Gridcolumn controls, each with its own group of children. 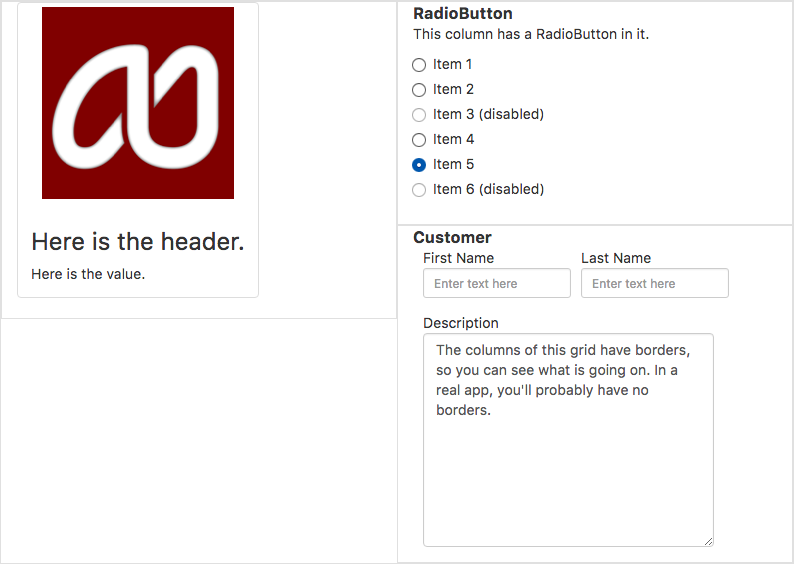 The first Gridcolumn has a header, the second a Radiobutton and the third has a Cuatomer. Te arrangement will depend on the screen size. GridColumn is a container which can have a number of controls as children. It should be used as a child of a GridRow control. It has size properties which determine how wide it is depending on the size of the browser's screen. It is an important part of making apps responsive, so they appear differently on different screen sizes. Number of columns (out of a total of 12) used by this column on large devices. Number of columns (out of a total of 12) used by this column on medium devices. Number of columns (out of a total of 12) used by this column on small devices. Number of columns (out of a total of 12) used by this column on extra small devices.